Georgia Garden Girl | Garden Great in Zone 8! Garden Great in Zone 8! 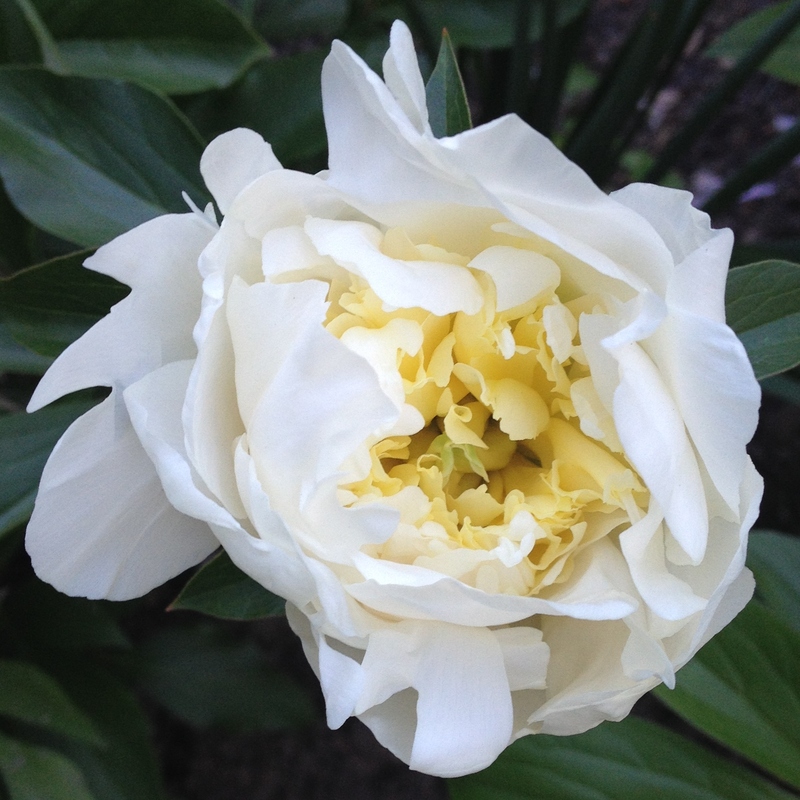 We had a very mild winter here in middle Georgia, so I was not sure that any peonies would bloom. But here’s what I found this morning, along with two heads of lettuce that are ready to eat! Hi friends! I hope you have been enjoying the rain here in zone 8. Everything looks very green outside! Just in time for spring for the green, the annual party for Trees Columbus. The party is on Tuesday, April 21 at 5:30 PM at the Spencer Environmental Center in Columbus. Please let me know if you need to buy a raffle ticket! They are $100, and you will be entered to win $10,000. The raffle ticket gets two people into the party. Beer (and wine), barbecue, and Bluegrass and NO speeches! I’m busy baking the desserts—lemon bars, cookies and other goodies. Thanks, White Oak Pastures and Loree Abell for the eggs! Now, those shells will go into the yard and provide my tomatoes with calcium to prevent blossom end rot. Happy gardening! It has been a busy time in zone 8. Some tomatoes are in the ground. Some aren’t. Zinnias are mostly planted, and I can’t wait until the basil is big enough to eat. I will do an update this weekend! But I did want to show you the amazing and magical thing Amazon Prime delivered today. 100 feet of copper mesh, which will keep slugs off of my plants. It’s on now, slugs! Boom! Hi friends! Long time no post. It’s been super busy here in zone 8. 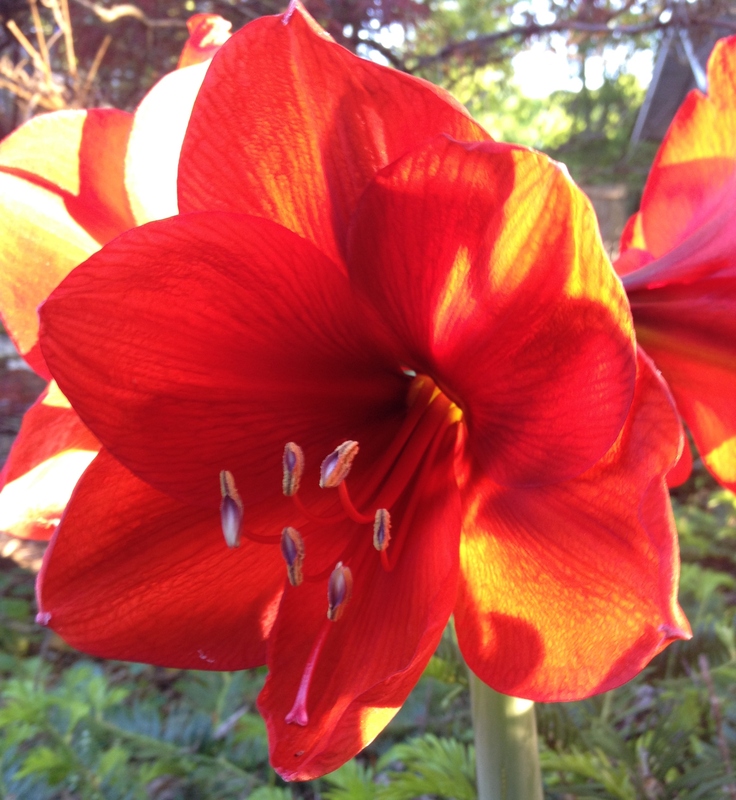 Daffodils have bloomed, dogwoods are blossoming, and warm season grasses are getting green. I started my veggie seeds a while back — everything is growing well! For the past week or so, I had them outside hardening off. But we have a frost warning, so I brought them in. Please do the same! More soon! I’m sorry it’s been such a long time since my last post. It’s been quite busy here. I’ve been harvesting lots of tomatoes and beans and cucumbers. 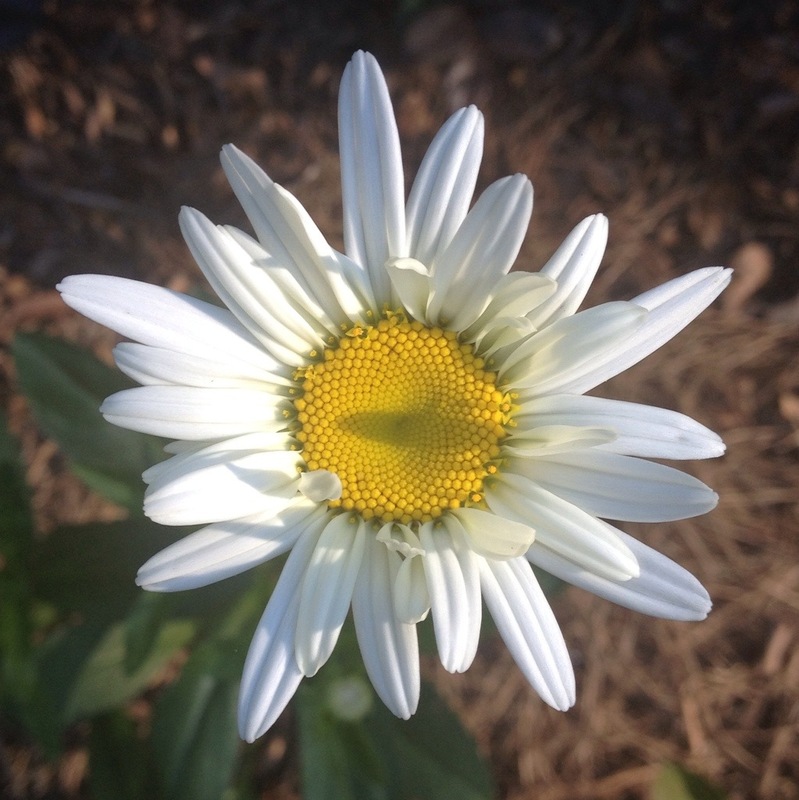 And my flowers are looking great — zinnias and dahlias and daisies. Everything even survived my two-week trip to Africa. Why? 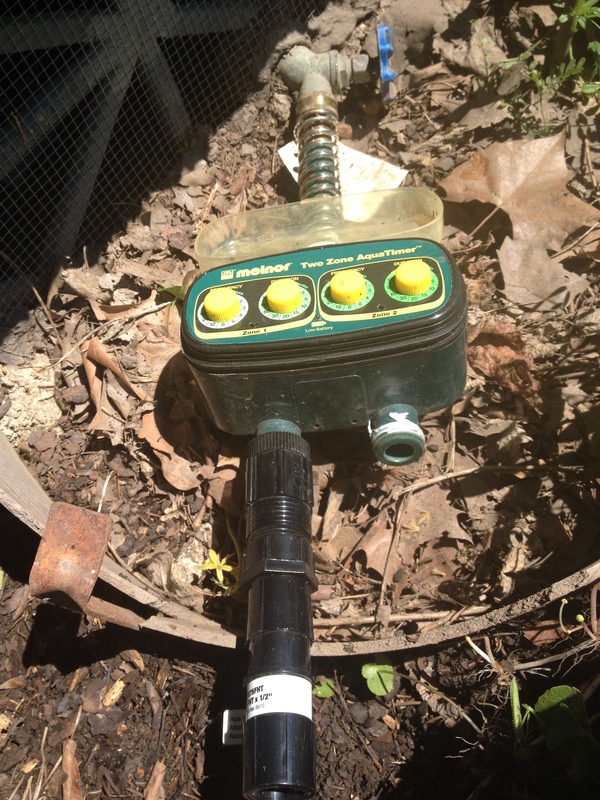 Irrigation on timers! If every day were like today — steady light rain — I would not need an irrigation system. But summer in Georgia can be hot and dry and unforgiving, so it’s a good idea to have an irrigation plan. Some of my friends water by hand. But that’s a huge time commitment, and we all know that I’m lazy. Fortunately, my house came with an installed sprinkler system for the grass, and I’ve got my veggies on a drip irrigation system. 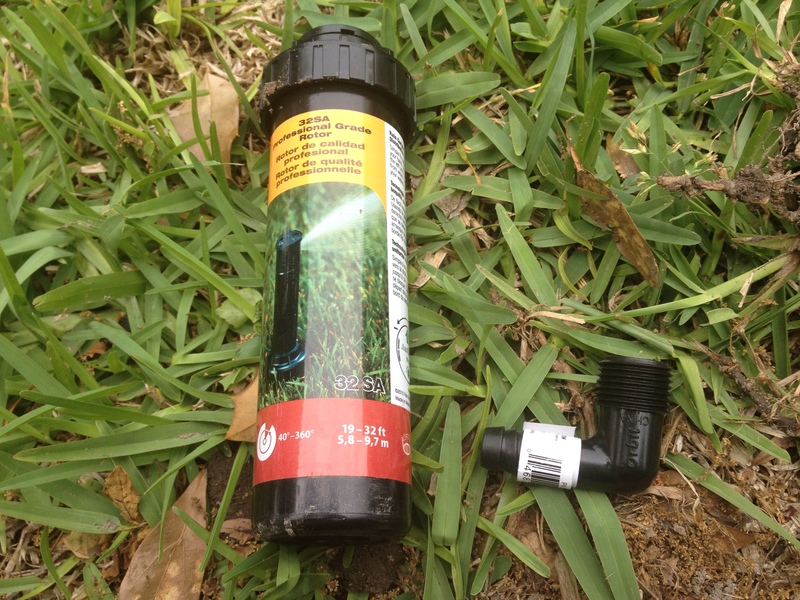 If you have grass, a sprinkler system can be helpful (some day, I will get rid of grass and go to an all drip system, but today is not that day). You just have to know how much water it emits. I like to use the pie pan test. I place pie pans at random places in the yard and see how much water is in them after ten or so minutes of sprinkling. Then I can calculate how long I need to leave the sprinkler on in each zone. Sprinkler heads are a lot like smartphones. They last for a while, and then they just die. For years, I shelled out money for the sprinkler guy to come out and replace broken sprinkler heads. But after watching him replace the last one, I realized that it’s not that complicated. So now I can save the $50 service charge and replace the sprinkler head myself! Step One: Confirm that the sprinkler head is, indeed, broken. Sometimes, a sprinkler head just gets stuck and needs a little push to start working again. 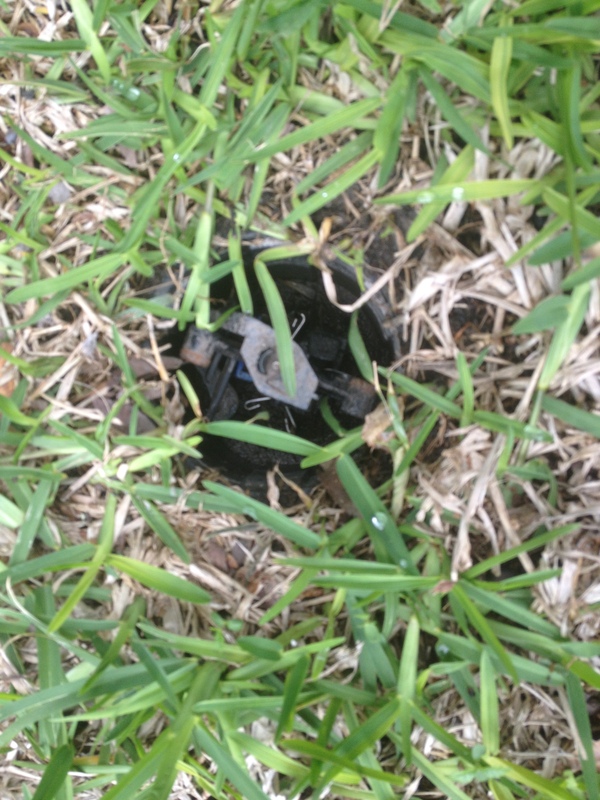 But this sprinkler head stopped oscillating and could not be fixed, so it needed to go. 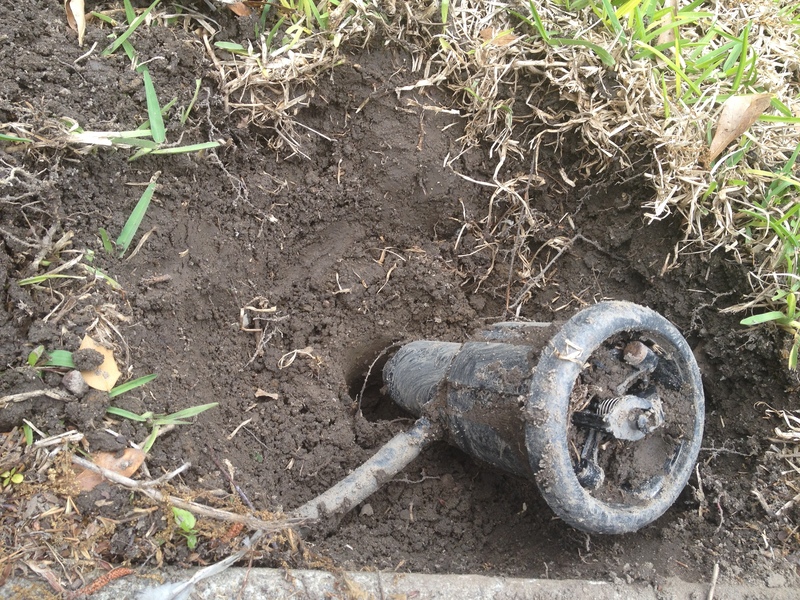 Step Two: dig up the broken sprinkler head. Be careful around the pipe! Step 3: obtain a new sprinkler head. Make sure you have the right connector! 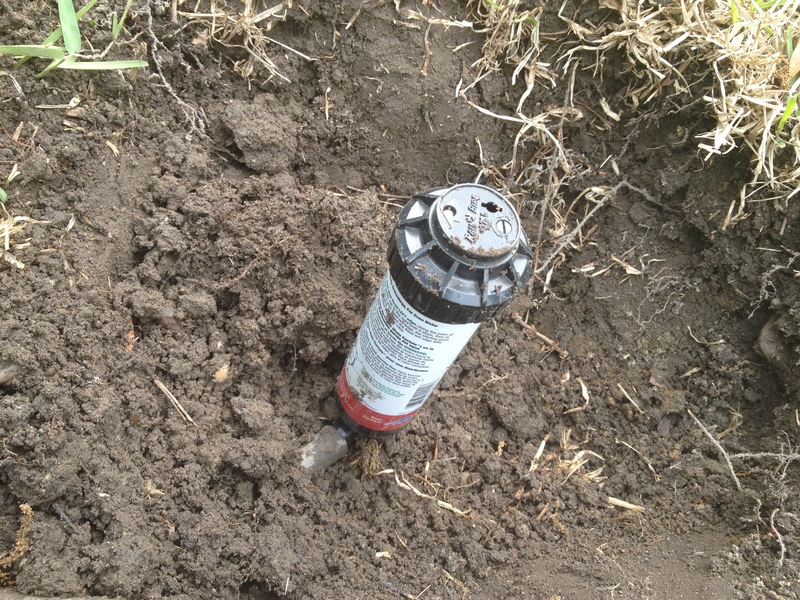 Step 4: Attach the new sprinkler head to the pipe and bury. 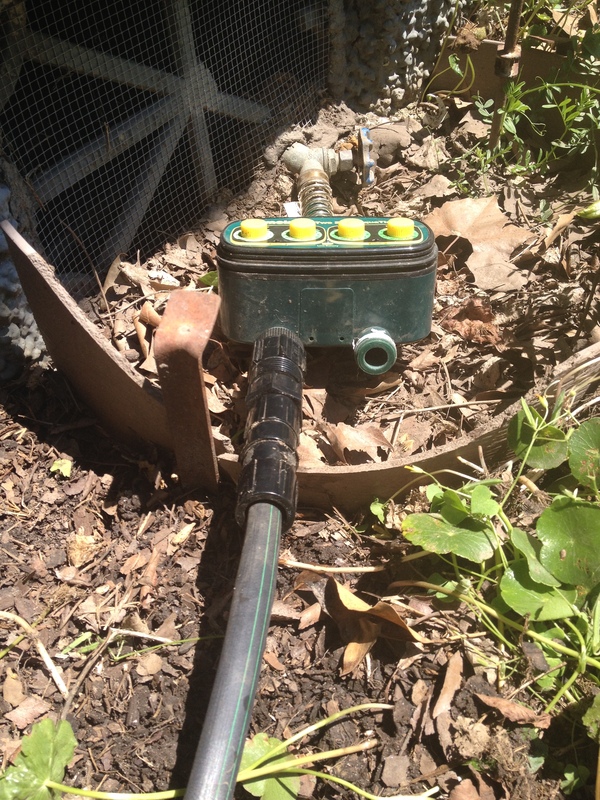 Make sure that the top of the sprinkler head is level with the ground. Then, you’re ready to adjust the sprinkler head so it conforms to the pattern and distance you need. I do like the sprinkler system. But I LOVE my drip irrigation system. It saves me a ton of time and water. My raised beds and all of my large pots (including the hanging pots) are on drip irrigation systems. All you need is: 1) a timer, 2) a backflow preventer (if your timer doesn’t have one), 3) pressure regulator, 4) hose-to-tubing connector, 5) tubing, 6) connectors and emitters and end pieces, and 7) an emitter “punch” tool. If you’re a beginner, you might try a kit. Step One: connect your timer, backflow preventer, pressure regulator, and tubing connector to the spigot. You may need to use plumber’s tape. Check for leaks and fix before moving to step two. Step Two: connect the tubing. Check for leaks and fix. 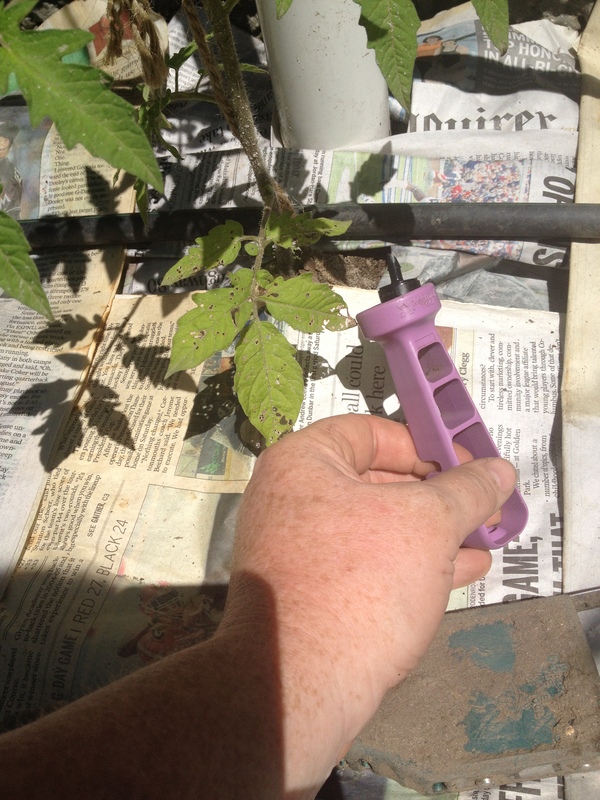 Step Three: use connectors to place the irrigation lines where you need them. Step Four: use the emitter punch tool to insert the emitter. 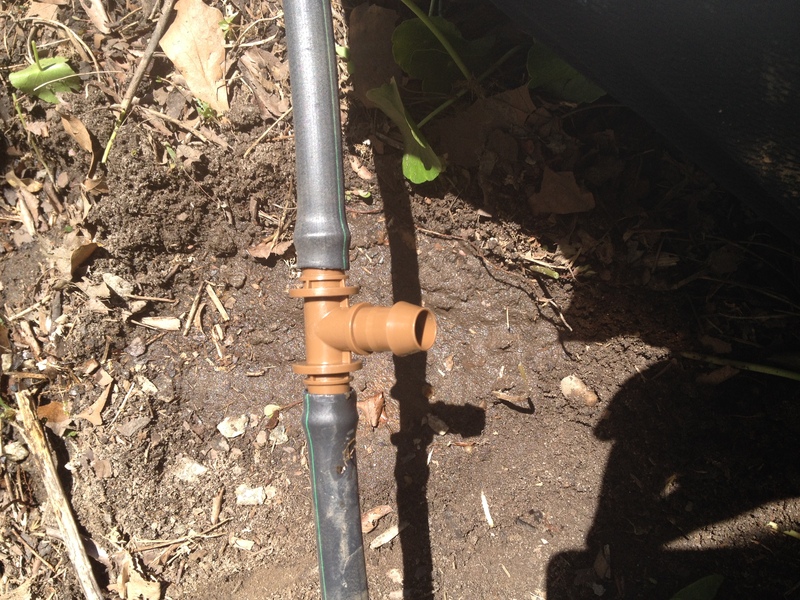 Step Five: If your main tubing is not close enough to your plant, use 1/4 inch tubing to irrigate your plant. Step Six: Check for leaks (if an emitter is not installed correctly, you may have a small geyser). And then set your timer! Now you’re ready to sit on the porch and have some lemonade. Enjoy! Today, my goal is to put down as much mulch as possible. 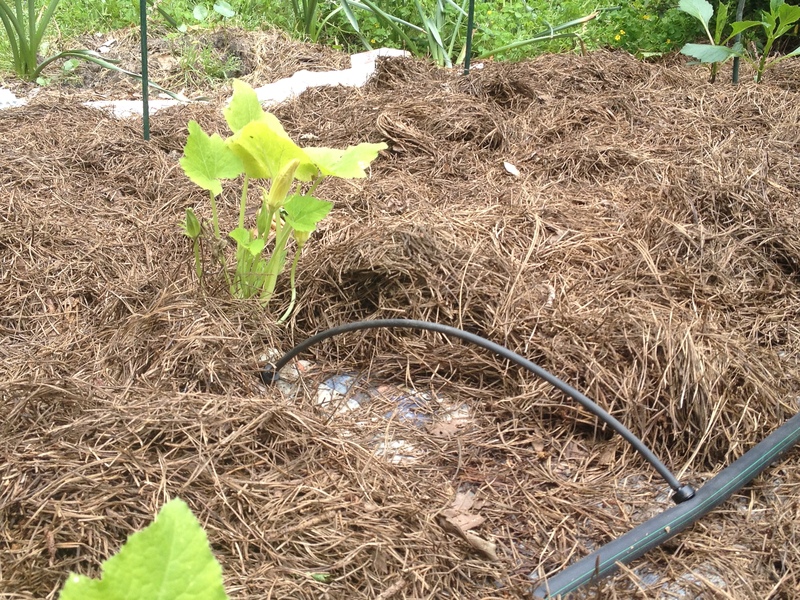 Mulch helps prevent weeds and water loss. So that’s my project. Yippee. 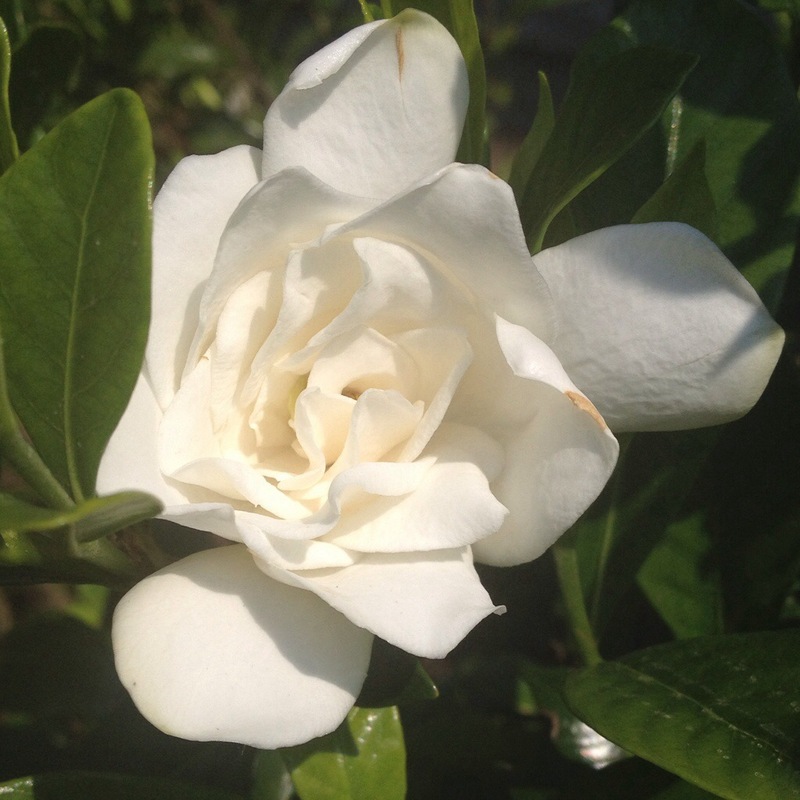 During my mulching, I saw some new blooms: daisies, hydrangeas, and gardenias. Summer is almost here, y’all! Mulch in progress: I put down newspaper first to slow down the weeds. Back to the yard. 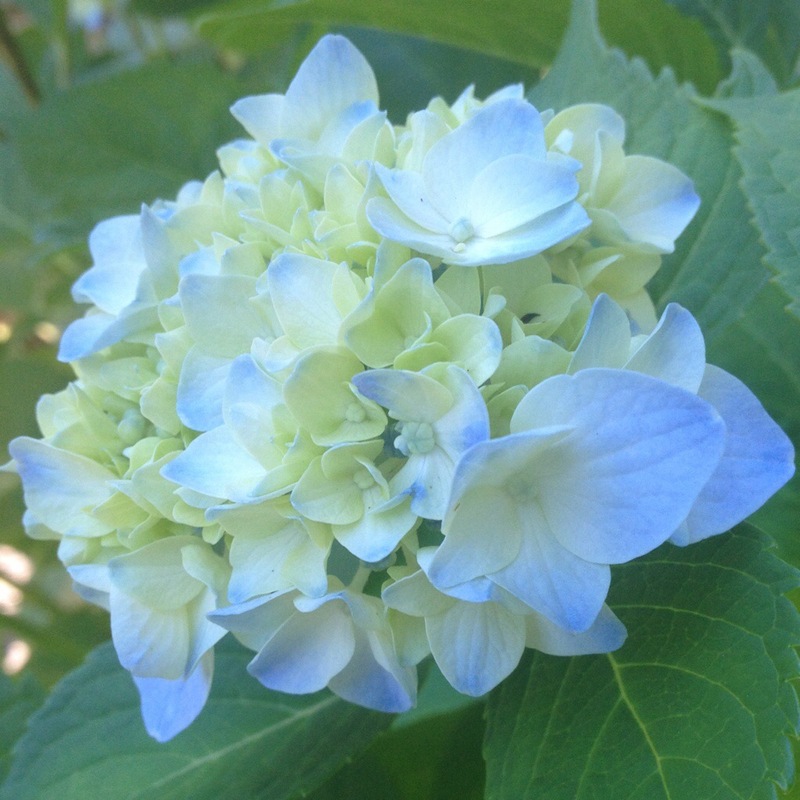 Enjoy this beautiful day! 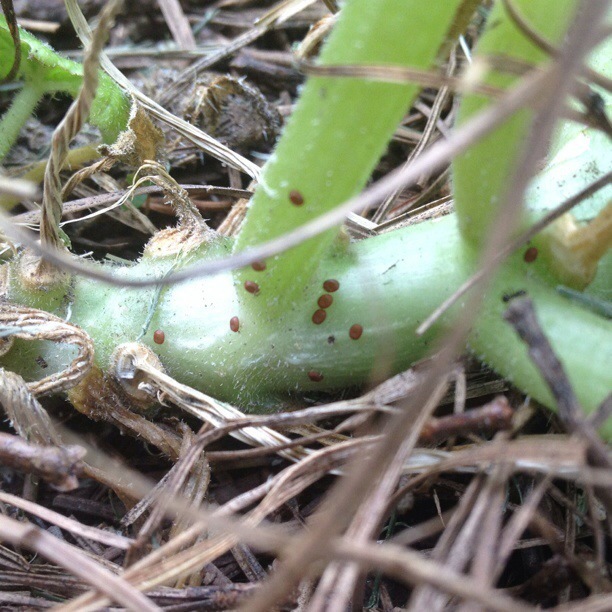 Squash Growers: Inspect for Invaders! 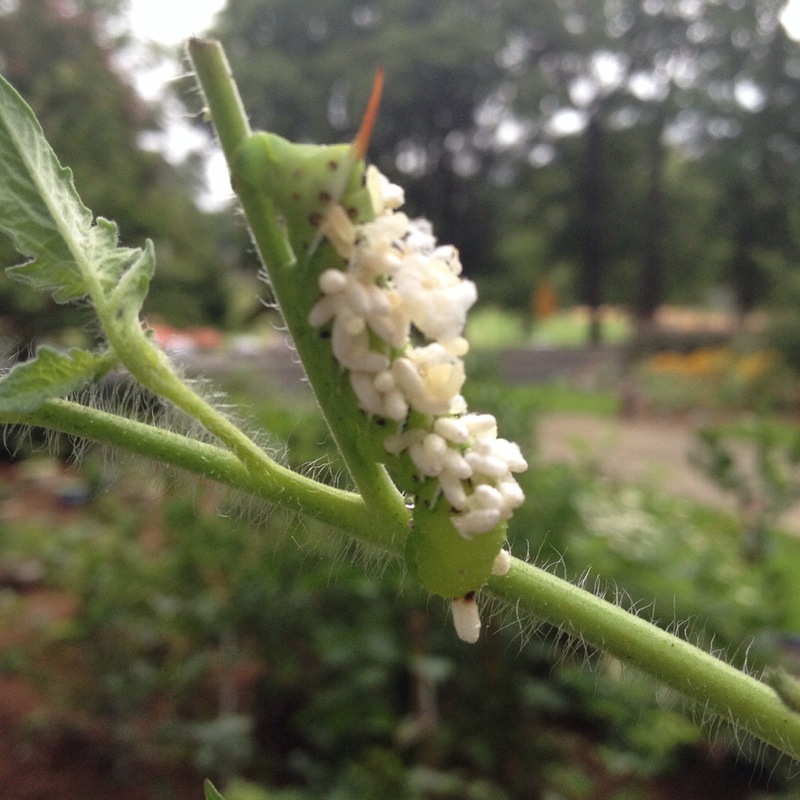 Every year, I have been thwarted by my evil arch nemesis, the squash vine borer. If you’re not familiar with this pest, count your lucky stars. 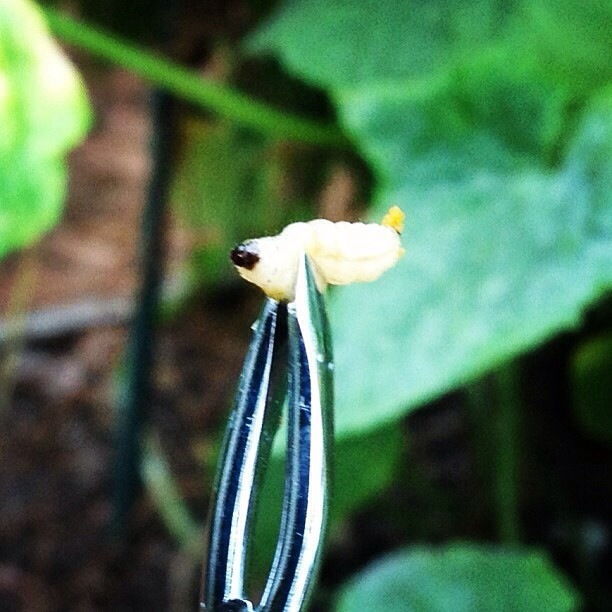 A squash vine borer will turn your beautiful zucchini plant into a wilting heap of tragedy overnight. It’s bad, y’all. So I moved my squash patch and resolved to be extra vigilant this year. I haven’t been great on the “extra vigilant” part, in part because of my wonderful trip last week to Holland, Michigan to see the tulips (more later). But I did move the zucchini to a spot that is right outside my carport, so I do see them a bit more often than I see some of my other veggies. I decided to check the vines for eggs yesterday, and I found some. The book Good Bug, Bad Bug by Jessica Walliser suggests picking off the eggs and squashing them, plus spraying with a horticultural oil. And then double check for frass. If you see frass (it looks like sawdust), that means that the borer larvae have already hatched and started treating your plant as an all-you-can-eat buffet. Gently cut the stem with an X-acto knife and extract the borer with some tweezers. Then cover the wound with dirt. Here is a picture of a larva from last year, when I didn’t catch the eggs in time. So, if you live in Middle Georgia and you’re growing squash or pumpkins, get outside this weekend and look for eggs. You’ll be so glad you did! I hope you got through last night’s storms all right. All seems to be well in my neck of the woods, but the folks over and Alabama and Mississippi are hurting again. I hope tonight’s storm is not as bad. As I was looking for downed limbs this afternoon, I noticed them. The snow peas! 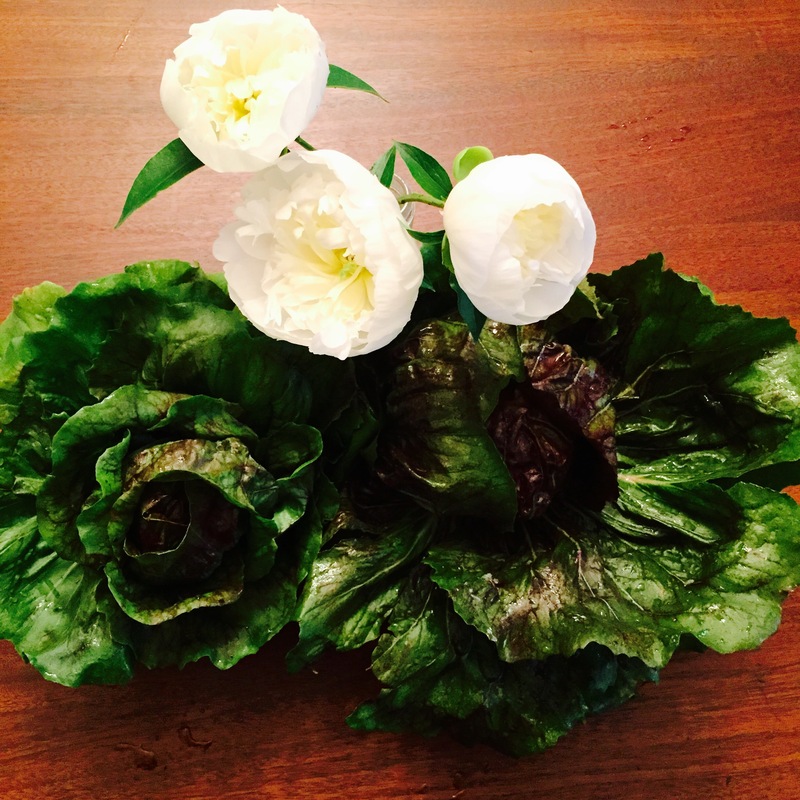 The first vegetables of my spring season! All fourteen of them! Some of which were a little too small to pick but I picked them anyway! So exciting! Yes, there will be many more snow peas. And yes, I do long for the days of summer when I have my first Cherokee Purple on white bread with Duke’s mayonnaise. But the first harvest is a big milestone. It means that the vegetable garden is officially awake. It means that the hard work and planning are starting to pay off. And it means that I can’t continue to put off reinstalling my drip irrigation system. 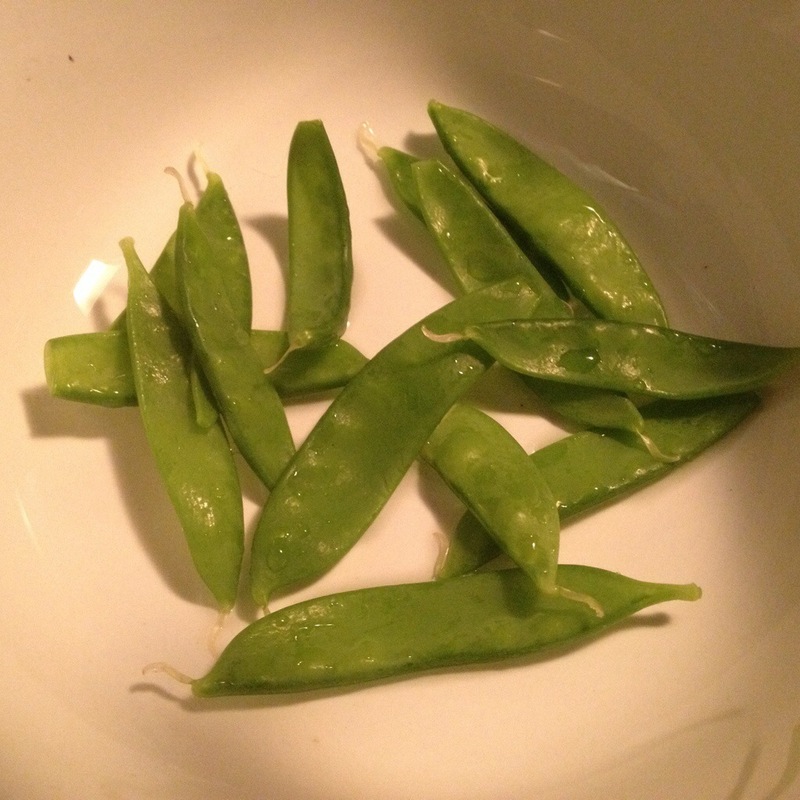 But for right now this second, I will savor each one of those fourteen little snow peas. Yum. We survived last week’s frost warning and rain and made it to Easter! Though the day started out chilly and gray, the afternoon could not have been more beautiful. After I worked the early shift for the mission trip pancake breakfast, attended an excellent Easter service at The Ridge, and took a walk with my trusty Great Dane Clementine, I headed outside to spend a lovely day in the yard. After I admired the flowers, I had to get to work. There was a lot to do! I spent most of yesterday afternoon pulling up pansies (and weeds) to make way for summer annuals. Today, I finally trimmed back the tea olive (I hated to cut them while they were blooming, so I just now got around to this task). Then I planted some zucchini and basil. Right. In. The. Front. Yard. Yes, people, I am a rebel. I figured 1) I’ve already got the tomato teepee, so I’m not destroying any fancy aesthetic by adding more veggies; 2) zucchini and basil are pretty; 3) there aren’t any draconian anti-vegetable restrictive covenants in my neighborhood (as far as I know); and 4) I was out of room in the raised beds. I planted my dahlias right behind the zucchini and basil. I had dug up the dahlia tubers last fall and then started them in pots in March. I planted all of the ones that had shoots (only one didn’t—oh, well). 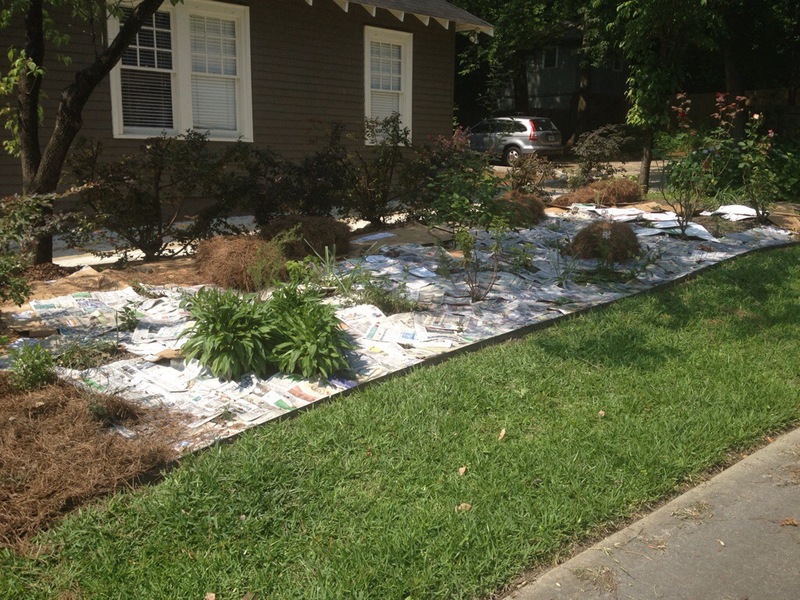 I’m trying a new approach to weed maintenance: newspaper and pinestraw. That’s right. My Ledger-Enquirers will serve an important second purpose: weed barrier. I have tested this approach in several areas in the past, and it really does work for about a season. So I’ve decided to expand. Why newspaper when the stores sell fancy weed barrier fabric? Friends, I’ve tried the fabric, and I’m here to tell you: don’t waste your money. Weeds are going to grow on top of the fabric after a year or two anyway. It’s a pain in the neck to cut holes when you want to plant something in the fabric covered area. And it’s expensive. Newspaper just lasts a season, but it’s easy to cut, and it’s free. If I want something a tad more durable–like for paths between my raised beds–I use cardboard or old towels and sheets that are too grungy for Goodwill. 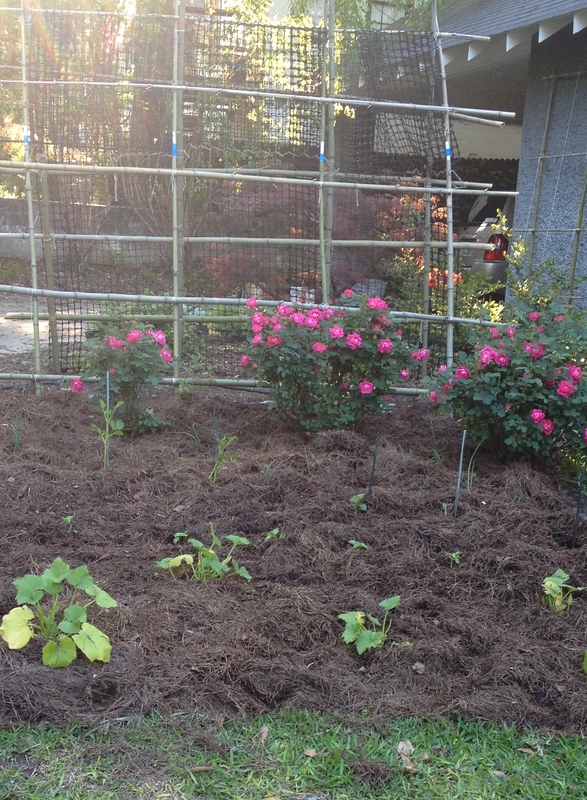 After I got the zucchini/basil/dahlia bed done, I used a similar approach with my strawberries and onions. I hope it works! I’ll keep you posted. Happy gardening. What Is a Frost Date? © Caroline Castle/Georgia Garden Girl, 2013-2014. Unauthorized use and/or duplication of this material without express and written permission from this blog’s author and/or owner is strictly prohibited. Excerpts and links may be used, provided that full and clear credit is given to Georgia Garden Girl with appropriate and specific direction to the original content.